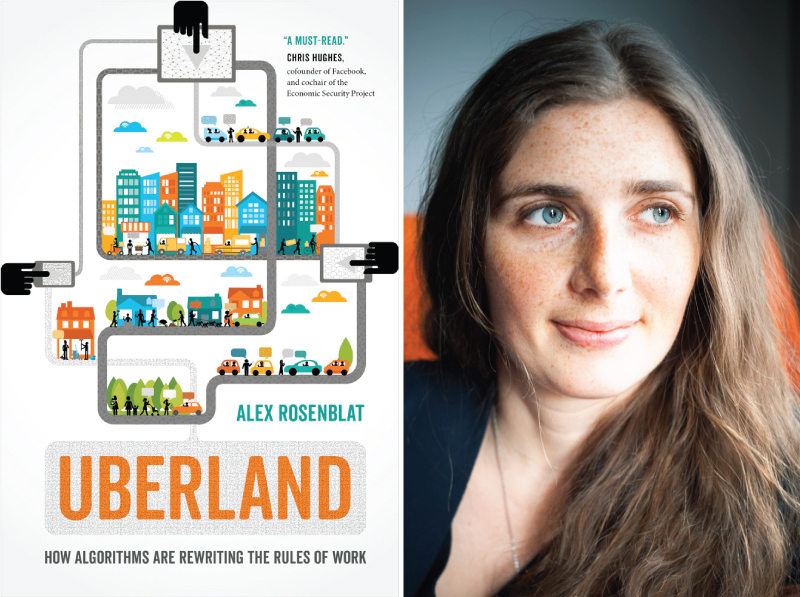 Join us for the launch party of the new book Uberland: How Algorithms Are Rewriting the Rules of Work by Data & Society Researcher Alex Rosenblat. Uberland chronicles over 5,000 miles logged with drivers in more than 25 cities in the United States and Canada over the span of four years. Rosenblat, an award-winning technology ethnographer, goes beyond the controversial headlines about Uber to convey new realities and analyze the future of algorithmic management. At 7:30pm, hear brief remarks from Alex Rosenblat, Michelle Miller, Co-Founder and Co-Director of coworker.org, and Mary Madden, Research Lead, Health + Tech Engagement at Data & Society. This public event is the third in a fall conversation series at Data & Society on themes from Social Instabilities in Labor Futures, a new Data & Society research initiative that recently released the ethnographic report Beyond Disruption: How Tech Shapes Labor Across Domestic Work & Ridehailing. Alex Rosenblat is a technology ethnographer. A researcher at the Data & Society Research Institute, she holds an MA in sociology from Queen’s University and a BA in history from McGill University. Rosenblat’s writing has appeared in media outlets such as the New York Times, Harvard Business Review, the Atlantic, Slate, and Fast Company. Her research has received attention worldwide and has been covered in the New York Times, the Wall Street Journal, MIT Technology Review, WIRED, New Scientist, and the Guardian. Many scholarly and professional publications have also published her prizewinning work, including the International Journal of Communications and the Columbia Law Review.